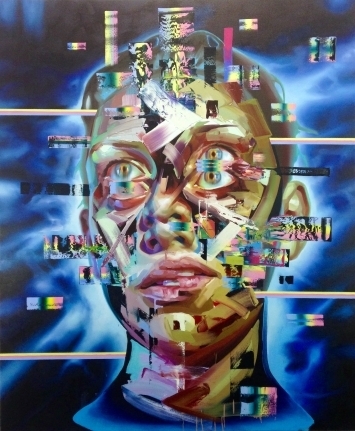 UNIX Gallery is excited to announce Justin Bower's representation in the exhibit, About Face on view through April 27th at Cal Poly Pomona's Kellogg University Gallery. About Face is less about portraiture, and more about taking the traditional definition of portraiture and turning it on its side – or completely around— in an opposite direction. Justin Bower is one of the most prolific contemporary artists who use the concept of “the portrait” not as a way of identifying or glorifying a particular person, but as a form of expressing ideas about how our environment –interfaced with technology, and sorely sprinkled with occasional bigotry, misogyny, violence, nostalgia and exceptionalism— permeates our world views and cultural identities.